i don’t understand why the knot is there. wouldn’t a basket hitch be sufficient? that would also provide more sling length to prevent upward pull on the wrench. a girth hitch, if you could sacrifice that bit of strength relative to the basket hitch, would be even better at preventing upward pull. While it may be silly to think about the ideal way to sling a crescent wrench as pro, if there’s any piece where you’d want the benefits of loose, extended, sling, this is it! Girth hitching would be the way to go, the weakening of the knot is irrelevant compared to the risk of it popping out. If you’re lucking enough for the ‘piece’ to hold, the sling would be plenty strong enough even with the hitch. I wonder if this person just placed this piece as a joke for their second.. But even as a joke, you’d want it to stay in, so that knot makes no sense.. Someone probably had it on their harness for tightening bolts?… I have no idea. 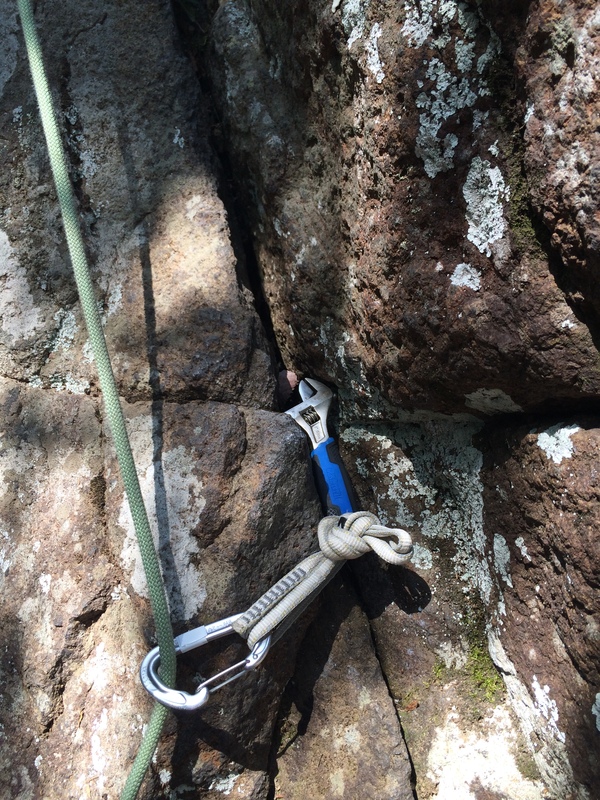 I’ve carried a crescent wrench up a trad climb to tighten the nut on the single bolt the crux. I suppose I might jokingly then leave it as pro for my second to clean & carry, if it was multipitch.